May | 2013 | Arthur in the Garden. I have seen several snakes this season and this must explain why my lilies are doing so well! This area has a problem with voles. Voles are a cousin of moles but lead a very different life! Voles eat plants while moles eat bugs and worms. Voles live above ground making tunnels through mulch and grass to reach the stems and roots which they eat. Moles dig tunnels underground but are looking for worms. They don’t hurt your plants but their tunnels are not attractive. When I first moved to this house I brought many cast iron plants from another house and planted many hostas but the voles ate them one by one over that first Summer. They only eat the root so that you would think the plant was only leaning strangely but when you tried to straighten it up the plant would come out of the ground with no roots! Ugg. They love lily bulbs, too! I love tiger lilies. I must have planted tons of bulbs when I moved here. They were all eaten with in a season or two. 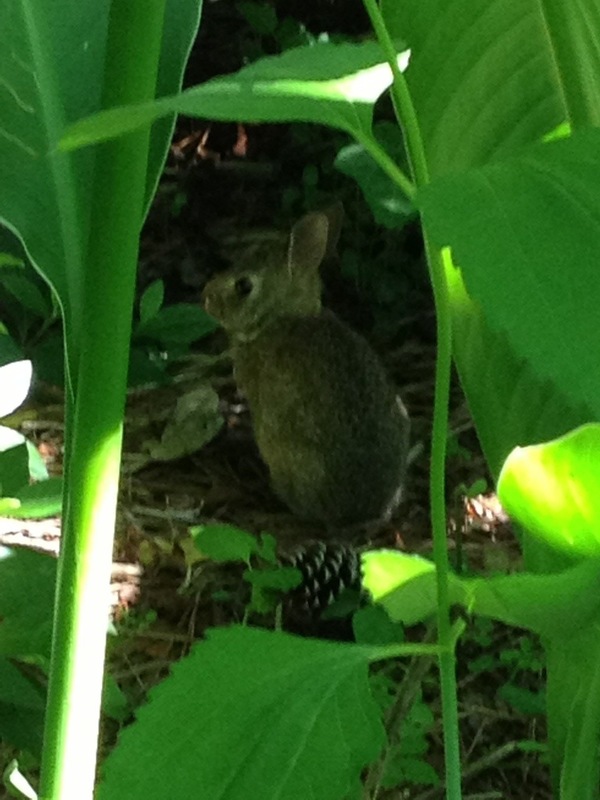 Rabbits are another animal that are plentiful in my garden, too! They don’t do much damage with the exception of chewing some plants here and there. They frighten me sometimes because they will sit motionless while I am pulling weeds then take off suddenly when I get to close. They are cute, thought! The one below was in the garden along the patio today. One time I was pulling English Ivy seedlings under a large Formosa Indica azalea when I saw, out the corner of my eye, a few hanging dead leaves. As I reached over to pick them I turned my head to get a better look at the leaves. I froze. I realized the leaves were actually three small brown bats! They didn’t seemed upset. They just continued licking themselves. They reminded me of mice, but with wings. I slowly backed out from under that azalea! In my neighbor I have also seen foxes, Red-tailed hawks, deer, nutria, and I am pretty sure I saw a few coyotes walking down the street one night! 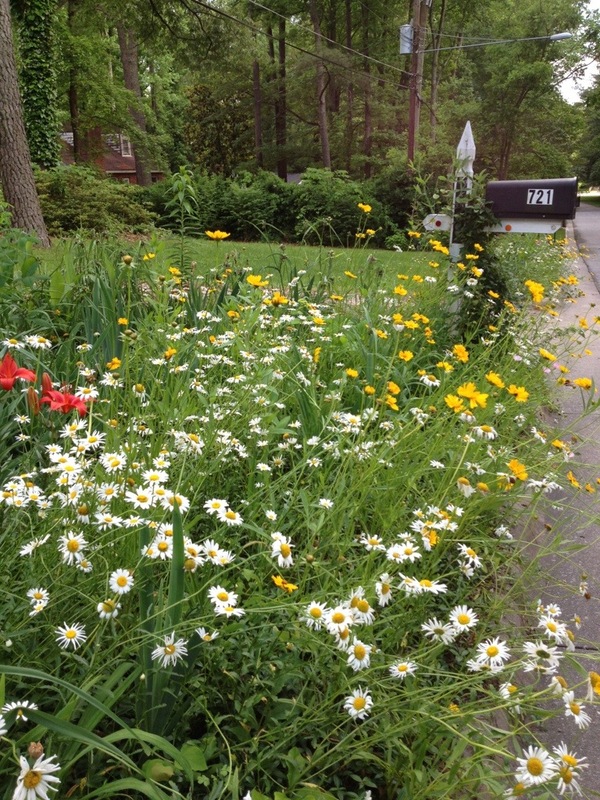 There must be plenty of wildlife in the wildflowers along the street for the hawks and such. Many spiders, as well! 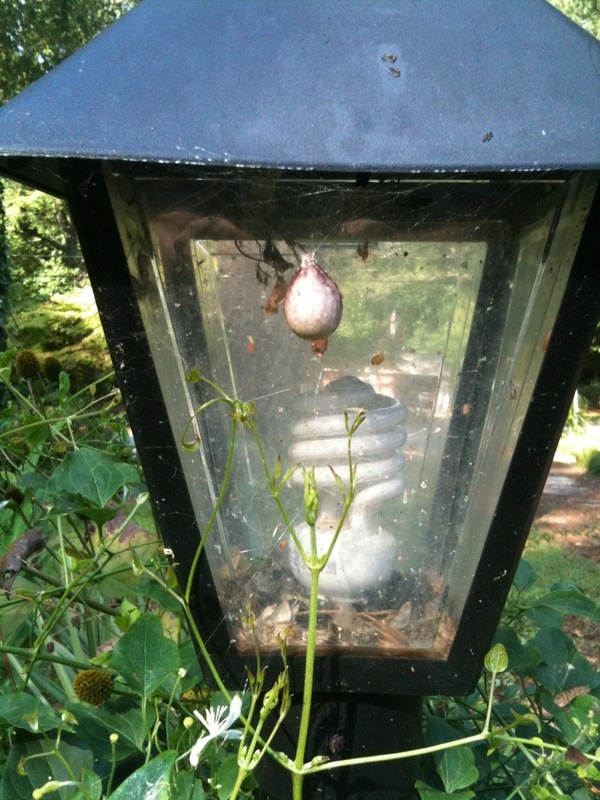 This is an egg sack on the post light by the driveway. These lights are on all night so I assume the spiders like to build webs here because of the endless supply of moths. The sweet potato. One is often confused about what to do with these odd-shaped orange fleshed tubers! I remember my grandmother would receive a box of them every Fall. She would always put one in a vase and would grow a beautiful vine throughout the winter. This would always amaze us kids! You can use sweet potato the same as a potato but, like the name suggest, they have a much sweeter taste than the usual starchy true potato. The sweet potato is actually the root of a vine in the morning-glory family. You have probably seen all the new hybrids that are used as bedding plants for ground cover? They have burgundy or pale green leaves which vine along the ground. They do produce small morning-glory type flowers but are grown for their foliage. 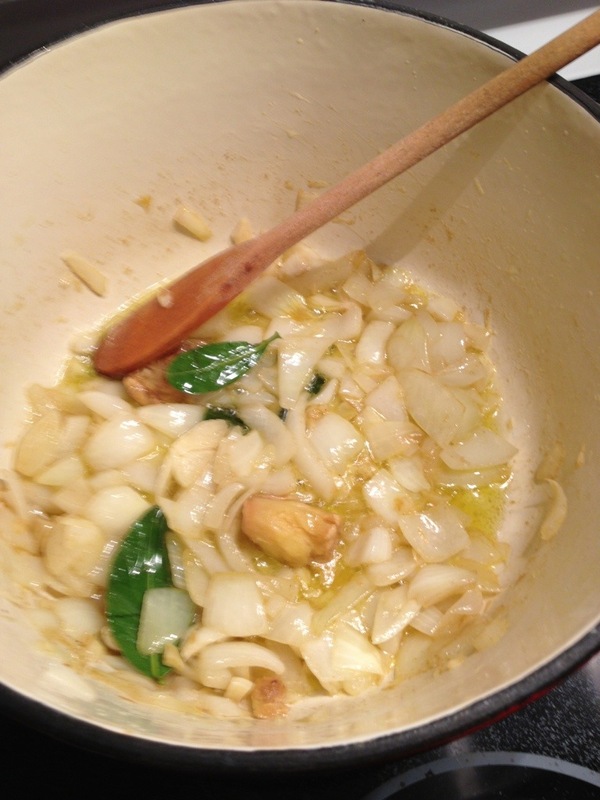 2) Add the onion, garlic, cumin, bay leaves, and about a 1/2 teaspoon of salt. Cook until the onions are softened but not brown. It should take about 10 minutes. Stir often. You can use this time to peel and dice the potatoes. 3) Add the potatoes and Chipotle. Stir to coat with the oil mixture. 4) Add the box of vegetable broth and turn up the heat. I also added two cups of water so that potatoes were floating and not touching the bottom. 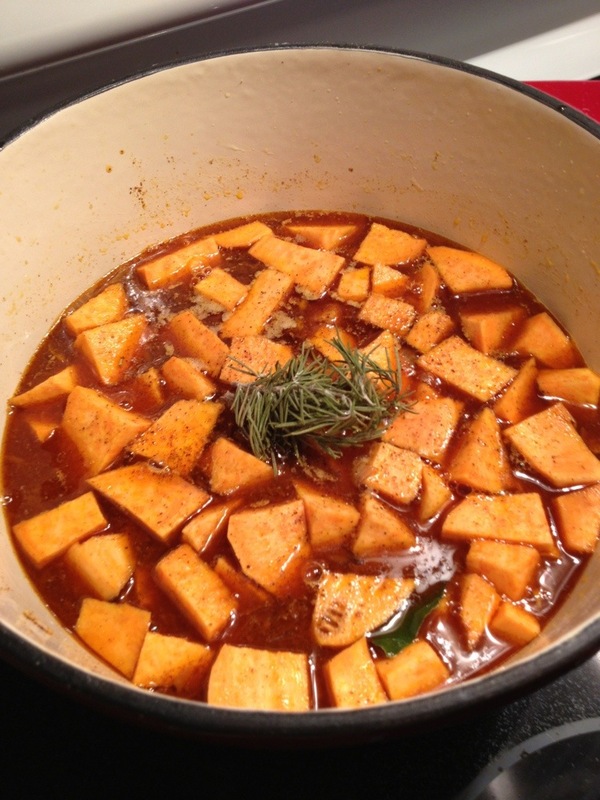 Add the rosemary, too. 5) Once it begins to boil, turn it down to medium low and simmer on a gentle boil for about 30 minutes or until the potatoes are cooked. Don’t worry if it is super hot and spicy from the chipotle. Once the potatoes cook and are mashed they will temper the spiciness. 6) After about 30 minutes the potatoes should be soft and cooked when you try to mash one with a fork. Remove from the burner and use a masher to press down to break up the potatoes. I like mine with some small chunks. I call it rustic! 7) Return to the stove. 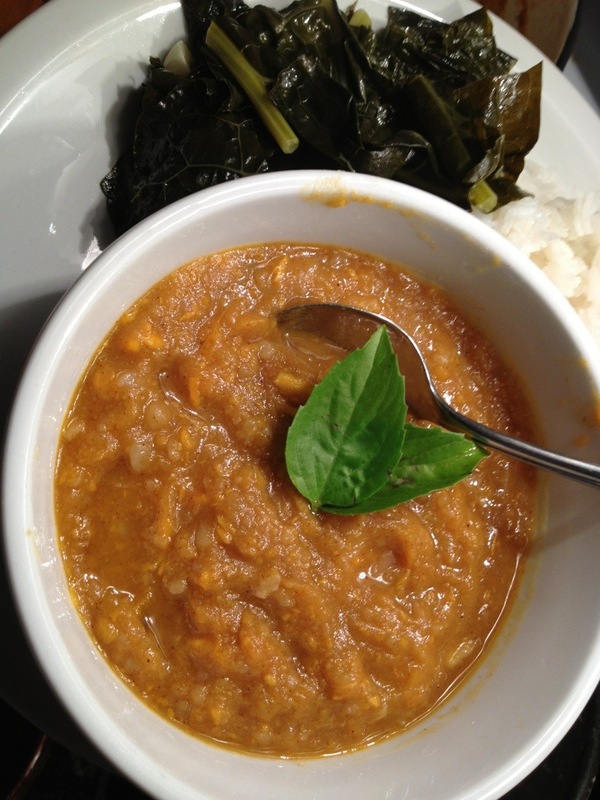 Allow it to return to a bubbling simmer. Taste and salt and pepper to your liking. You should notice that the sweet potatoes now have softened the smoky spiciness of the chipotle powder. Remove the bay leaves and any of the rosemary needles you can get with a fork. 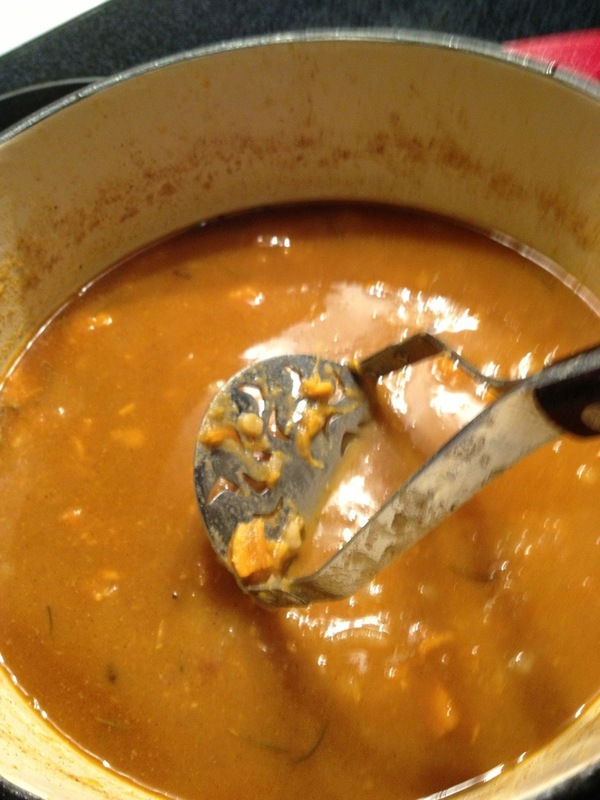 They should have settled around the edges of the soup. Its ready to serve! It has a bite so if you are not a spicy food fan you may reduce the chipotle powder to a teaspoon. I also cooked a small bunch of kale with vinegar, salt and water. Kale with vinegar and salt. While the soup was cooking I decided that it was going to be very spicy and I need something to help remove the chipotle residue from my mouth and throat and help cool me down. So I put on a pot of kale. 1) Melt butter and oil in a heavy pan over medium heat. 2) Chop the kale in ribbons. Turn them in the pot to coat with butter and oil for a minute or two. 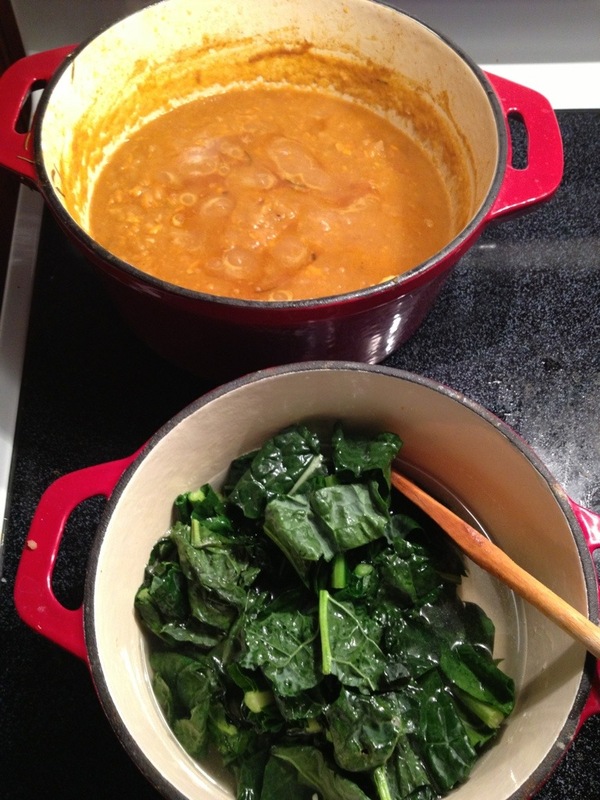 3) Fill the pot with enough water so the kale is floating and turn up the heat. Bring it to a boil then turn down to a simmer on medium low. Add about two tables spoons of vinegar. I use white zinfandel vinegar. Salt liberally. I also added a diced garlic clove. 4) In about 10 minutes or so it should be wilted and dark green. If you don’t like the ribs you may remove them before cooking. So with some rice on the side this is what dinner was looking like! 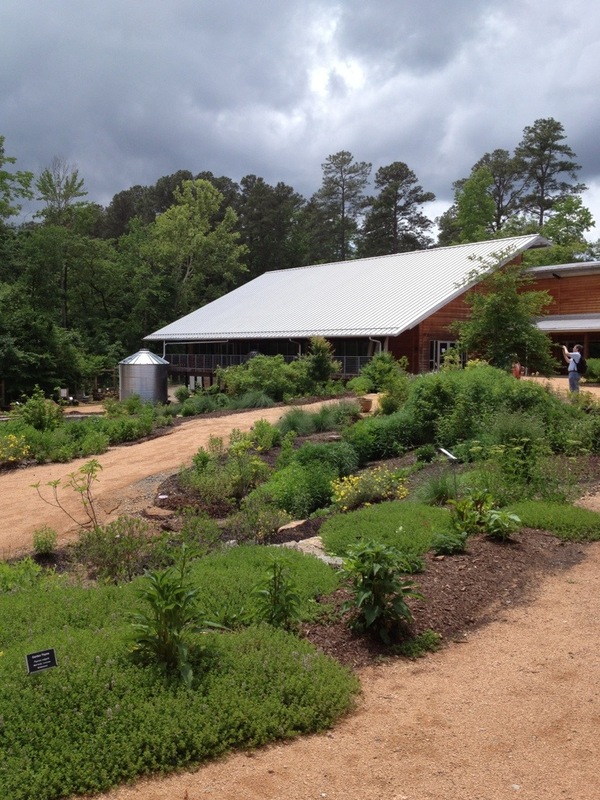 A walk around the North Carolina Botanical Gardens. North Carolina has many beautiful public gardens. I am very thankful the land was saved for these and, in a few instances, they were private gardens that were left to the public upon death of the gardener. The North Carolina Botanical Garden (http://ncbg.unc.edu/) is a beautiful garden located in Chapel Hill and is part of The University of North Carolina at Chapel Hill. 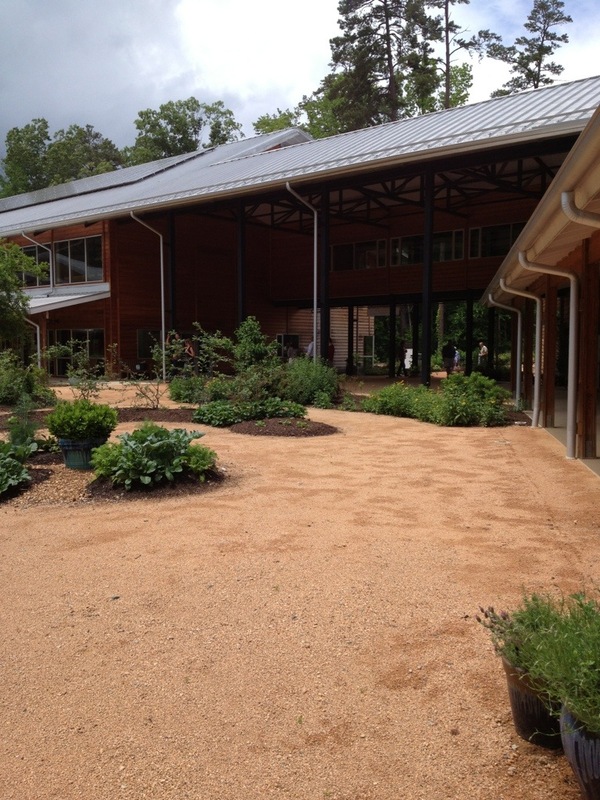 It has focused on native plants for over forty years. The Education Center below is surround with theme gardens and a large ecological preserve with a nature trail. There is a small nursery to purchase native plants. 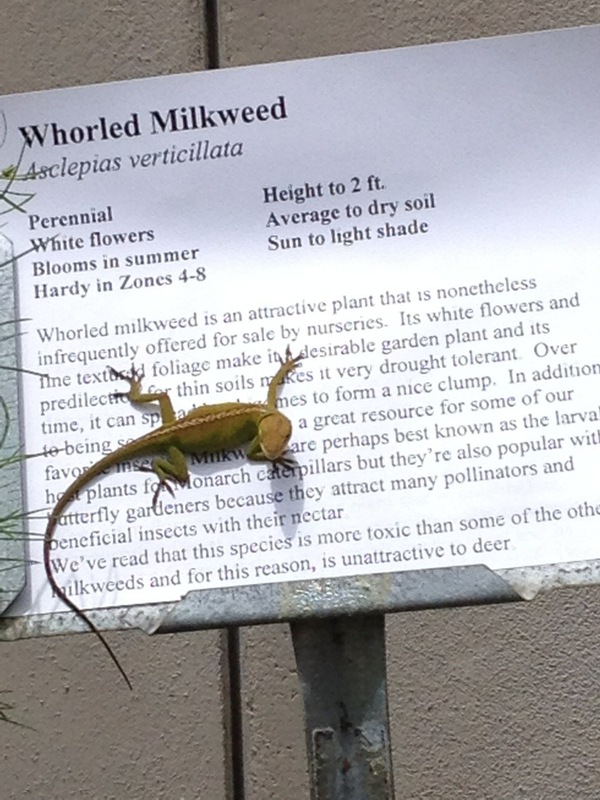 Here is a Carolina Anole sunning itself on this cloudy day. 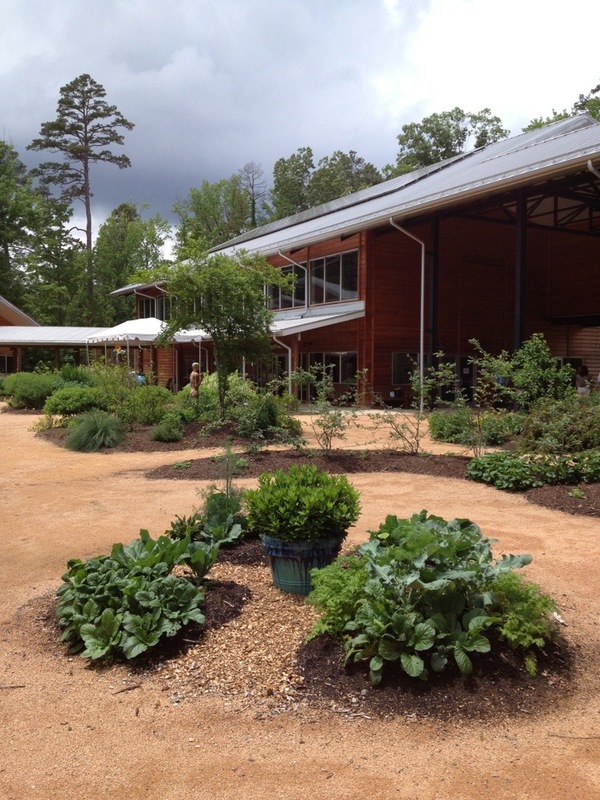 Examples of sustainable gardening with native plants surround the main building. There are several large tanks to store rain water from the building’s roofs. And examples of small plot vegetable gardening. I love all the sustainable features of the main building: solar panels and all the gutters are connected to large water tanks. 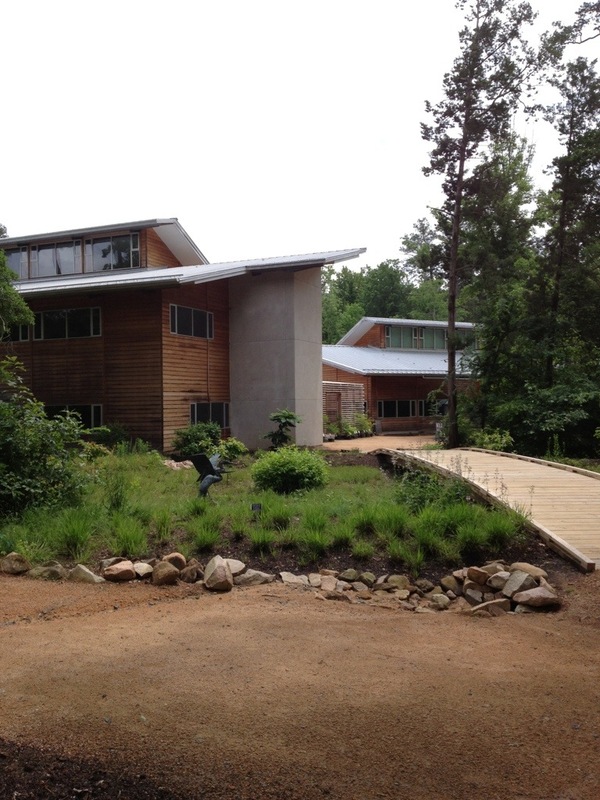 The property is surrounded by an 8 foot fence to keep out deer and there is a poisonous plant garden, a carnivorous plant garden and a sand-hills plant area, too. 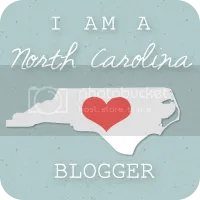 Visit their website for more information and other locations throughout the State of North Carolina. It well worth a visit.